The NC Clean Marina program is designed to show that marina operators can help safeguard the environment by using management and operations techniques that go above and beyond regulatory requirements. Clean Marina is a voluntary program that began in the summer of 2000. Marina operators who choose to participate must complete an evaluation form about their use of specific best management practices. If a marina meets criteria developed by N.C. Marine Trades Services and the Division of Coastal Management, it will be designated as a Clean Marina. Such marinas will be eligible to fly the Clean Marina flag and use the logo in their advertising. The flags will signal to boaters that a marina cares about the cleanliness of area waterways. Marinas that do not meet the standards will be able to learn about improvements needed for Clean Marina designation. Marina owners can reapply after making the necessary changes. Clean Marina is a nationwide program developed by the National Marine Environmental Education Foundation, a nonprofit organization that works to clean up waterways for better recreational boating. The foundation encourages states to adapt Clean Marina principles to fit their own needs. North Carolina joins South Carolina, Florida and Maryland as states with Clean Marina programs in place. 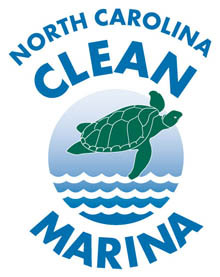 The N.C. Clean Marina program is a partnership between N.C. Boating Industry Services, the N.C. Marine Trade Association, the Division of Coastal Management, the Albemarle-Pamlico National Estuary Program, N.C. Sea Grant, the U.S. Power Squadron, and U.S. Coast Guard Auxiliary. Did you know there is now an Inland Clean Marina Program managed by the N.C. Wildlife Resources Commission? Learn more about it on the WRC website.